Growing up, my family didn’t do a lot of doughnut-eating. The popular treats were never in the house, so we’d only have them once in a while, usually if there was a function after church. As a result, I never became much of a doughnut connoisseur. That being said, I certainly did have my favorites when I was presented with a box of doughnuts. They were, in this order: Boston cream, the ones with chopped nuts around the outside, and cinnamon-sugar. Last year, I made my first batch of homemade buttermilk doughnuts and tried three different varieties – chocolate-glazed, vanilla-glazed and cinnamon-sugar coated. My favorite was, by far, the cinnamon-sugar variety. Over the last month I’ve been filing up my Doughnuts board on Pinterest with tons of different awesome-sounding recipes, including pumpkin. 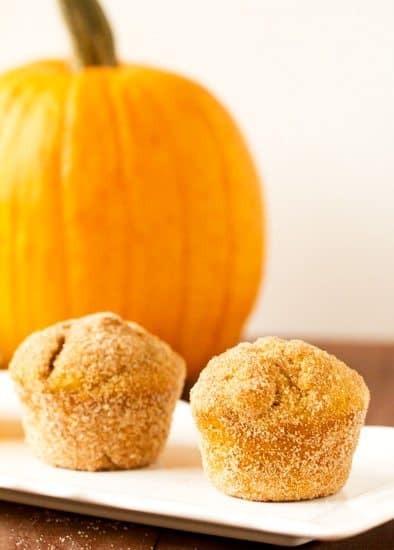 When I came across a recipe for pumpkin muffins that mimic the texture and flavor of pumpkin doughnuts with a cinnamon-sugar coating, I knew I was in business! 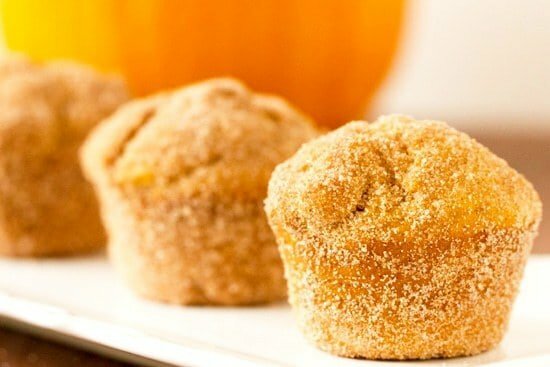 Once I saw the recipe, I recalled other muffin recipes I had seen on some other sites that used the same type of technique to mimic the flavor of a doughnut. 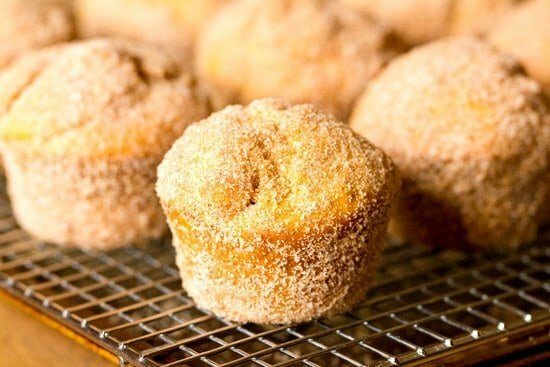 Once the muffins come out of the oven and are still warm, they’re brushed with melted butter and then immediately rolled in a cinnamon-sugar mixture. 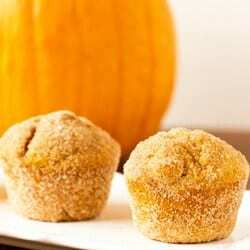 The result is a fabulous pumpkin-flavored muffin with a doughnut-like cinnamon-sugar coating. They are every bit melt-in-your-mouth fantastic as you could imagine. I love how much the pumpkin flavor in these shines through, and I love that these taste just like a pumpkin doughnut, but have the advantage of being baked, and not fried. Not as much fat, not as much effort, not as time-consuming, and not as much mess. That translates to a perfect Sunday morning treat! A muffin perfect for fall! Preheat oven to 350 degrees F. Butter and flour 12 standard muffin cups. Make the Muffins: In a medium bowl, whisk together the flour, baking powder, baking soda, salt, cinnamon, ginger, nutmeg and cloves; set aside. In a small bowl, whisk together the buttermilk and pumpkin; set aside. Beat the butter and brown sugar on medium speed until light and fluffy, about 3 minutes. Beat in the eggs, one at a time, scraping the sides of the bowl as needed. Reduce the mixer speed to low, then add the flour mixture in three additions, alternating with two additions of the pumpkin mixture, beating until barely combined. Turn off the mixer and fold the batter a few times with a rubber spatula to catch any pockets of flour that weren't incorporated. Divide the batter evenly between the muffins cups (about a heaping 1/3 cup batter). Bake until a toothpick inserted in center of a muffin comes out clean, about 30 minutes. Let the muffins cool on a wire rack for 10 minutes. Make the Cinnamon-Sugar Coating: While the muffins are resting, combine the sugar and cinnamon in a shallow bowl. Working with one muffin at a time, remove the muffins from the pan, brush all over with the melted butter, then toss to coat in the cinnamon-sugar mixture. Return to the wire rack and let cool completely. This is terrific as written. An easy delicious recipe. Everyone loves it. My granddaughter asks to make it whenever she visits. I love these and make them a lot. Curious, how would you convert to a bundt cake? Hi Carolyn, You’d want to double the recipe, for sure. From there, you’ll have to use trial and error on the baking time, then perhaps brush with melted butter after baking and sprinkle evenly with the cinnamon-sugar coating. Sounds amazing, but somebody can explain the conversion from cups to grams. I look on some sites but the quantity is so different . Thank you. Wonderful. Seemed like these might be fussy to make but they weren’t – they went together easily and came out spectacularly moist. I used homemade kefir instead of buttermilk, but otherwise followed directions. Perfect for a snowy Sunday morning. Made these last night in mini muffin form. Super easy and taste delicious! Has anyone tried these with white wheat, or whole wheat flour? I am really tempted to make these, but I only have cinnamon, nutmeg, and pumpkin pie spice. No ginger, no cloves. Any idea on how I can adjust this fittingly with pumpkin pie spice? Thanks! Hi Brittney, You can substitute 2 teaspoons pumpkin pie spice + ½ teaspoon cinnamon for all of the spices, you will just lose out on the clove flavor (that’s not included in traditional pumpkin pie spice). I really wanted these to be delicious! They turned out very dry and not sweet at all (the muffins themselves weren’t sweet and the cinnamon-sugar topping did not stay because they were too dry). Yes, that wouldn’t be a problem. Happy Thanksgiving! Made these this morning, and they were divine! So moist and warm and Autumn-y. Hi. I made these yesterday and they were really good! However, when i packed them in a container, the sugar melted and created a pool at the bottom. I waited a few hours until the were cool so I am not sure what happened. I would love to have some help. thanks! Truly one of the best Pumpkin treats I have ever tasted…just like sinking your teeth into a long anticipated Pumpkin Donut. I baked a batch for a girlfriend gathering and the effort in making these was worth every minute of time of preperation. Whatever you do bake a batch and share! Highly recommend! I made these for the first time today as an afterschool snack for my kids. They. Are. Amazing!! The recipe made 12 very large muffins. The texture was wonderful. Will definitely be making these again! Rookie mistake- I CAN’T believe I forgot the eggs. I kept thinking “this is a weird texture…” But went on with it. Well, turns out they are STILL delicious, just maybe not so donut-y. If anyone else makes a silly move like me, press on! They are delicious! What an absolutely wonderful idea! These look amazing! 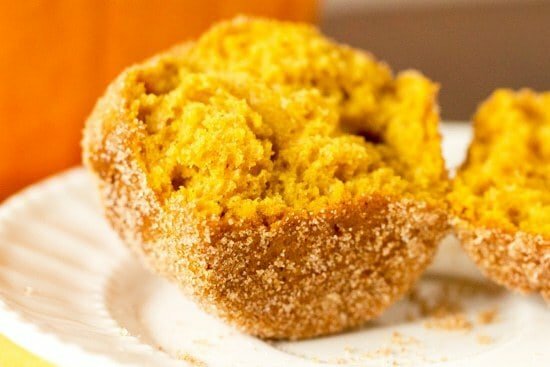 Pumpkin Doughnut Muffins… I love it! I rarely leave comments for recipes. Usually, I just make sure I print that “good find” off and put it in my Top 100 and growing list of recipes. But THIS sweet crusty little GEM—Oh my Jesus.! And yes I believe in HIM. This muffin is SOOOO buttery, TENDER, moist, sweet and cinammonnn-yee. I know that’s not a word—but it is now. You have GOT to make this. Don’t comment and say stuff like “Oh this sounds delish or I have got to make this”. Quit wasting your time and make this tonight!!! Please! Although muffins are a bit denser than cupcakes and oven temps vary…I automatically set my timer for 15-18 minutes. It’s habit for little breads not knowing the specified minute to bake was…30??!. That seems like an extremely long time for such small delicious-ness…ness. My time was perfect. If in doubt do the tooth pick test. You won’t be sorry. Great, Great recipe for a muffin. Okay…I bought a can of Libby’s Pumpkin that has been sitting in my pantry for a week now, with no recipe in sight, but your review sold me on this recipe! I too love it when someone actually tries a recipe then gives us feedback on how it went over. You seemed to have had excellent success…I’m gonna give it a try soon! Thanks. Could you make these in a mini donut maker? Hi Katy, I’m not sure, as these are meant to be baked as muffins, not necessarily muffins. You could definitely give it a try! I did end up trying these in a mini donut maker. They came out great! They took about 4 minutes to cook. I didn’t want to stand there all day, so I made the rest in a mini muffin pan. They took about 12-14 minutes to cook. I just used cinnamon because I was out of everything else, about a tablespoon. I think next time I’ll use Pumpkin Pie Spice. Also used soured milk instead of buttermilk because I didn’t have any on hand. YUMMY! Will definitely be making again! LOVED these muffins – so did my family! Making them again Thanksgiving morning. Shared on my blog! These were awesome. I was a bit worried because the texture looked a little different than normal muffins, but they were perfect. I got 12 muffins plus a little extra I put in a ramekin and baked separate. DELICIOUS!!! Am I blind or the only one not getting it… ?? step #3 says “beat the butter and brown sugar on medium speed…” but the ingredient list goes from buttermilk to brown sugar… how much butter is supposed to be used in the recipe and if you’ve made it already without it butter do they turn out ok?? thanks! Hi LeAnn, Butter is the first ingredient listed in the recipe. Made these today as minimuffins. I incorrectly assumed 12 muffins = 24 minimuffins, but I made 24 mini and 12 regular (on the small side) muffins. I always seem to have way more batter than the recipe calls for. The batter is very doughy, seemed like if you left it, it would rise. I cooked the minimuffins for 20 minutes, which seems just right (not over cooked). I had cinnamon sugar and butter left over after coating all 36 muffins. I found after you got your brush saturated with the butter, you could coat 2-3 muffins with it. As someone else noted, the pumpkin flavor is not pronounced. I used my 8c glass measuring cup for the sugar/cinnamon bath, and it worked out great, especially with the minimuffins because I could shake it around and not have the mixture go all over the place. We tried these and they were scrumptiously delightful!!! We doubled the recipe, and the only problem was that they came out to 36 muffins instead of 24. Also, we only had to cook it for 23 minutes, not 30. Those were our only problems. Otherwise, the muffins themselves were heavenly! Perfect texture and we loved the coating. Thanks!